? 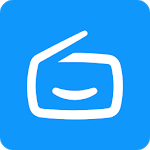 Simple Radio by Streema is the simplest way of listening to your favorite FM Radio stations, AM Radio, Internet Radio Online and Free radio stations.
? With over 45,000 stations, you can listen to the ones you’ve learned to love, or sit back and discover new gems from any region of the world. 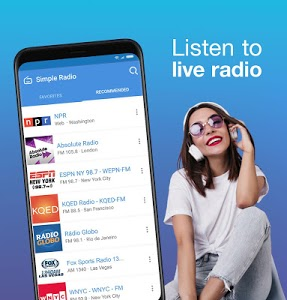 Simple Radio is the first app that combines the multiple benefits of online radio with the simplicity of the radio tuners of yore.
? It's really easy to find any radio station. Search by genre: pop radio stations, rock radio stations, news radio stations, sports radio stations, etc. or search by country (like USA radio stations), by genre, by format, by state or by city (like New York radios or Los Angeles radios).
? Streema is on a mission to simplify the radio listening experience on the web and mobile devices. Simple Radio is a product of that effort and we are eager to get your feedback!
? Listen to NPR radio, BBC radio, sports radio, News radio, christian radio, Radios Latinas, Radios Mexicanas, MRN, 77 WABC, WBAP News Talk 820 AM, La Mega 97.9, KNBR, WNYC, Shekinah Radio and many more!
? Music: Pop, Rock, Hip Hop, Latin, Rap, Blues, Country, Jazz, Classical & more.
? Sports: NFL Football, MLB Baseball, NBA Basketball, MLS Soccer, NHL Hockey, Nascar & more. Simple Radio sports an extremely clean user interface that gets out of your way and helps get you tuning in ASAP. Many radio apps can be too complex when you're just trying to get a station to play. With Simple Radio, that’s a thing of the past. Getting to the station you want to listen to as fast as possible is super important - with Simple Radio you’ll always have one-tap access to your favorites. The app is optimized to make day-to-day use as smooth as possible, whether at home, at work or in the car. Using Streema’s experience in serving more than 10 million listeners per month, Simple Radio features unparalleled levels of stability and reliability. We know how important this is. That’s why we push relentlessly to further improve the quality of the listening through the app on each release. *An internet connection (wifi or mobile data) is needed to play any radio station. 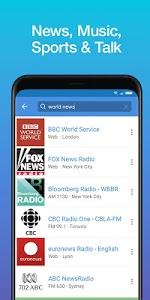 Open Simple Radio on Android Auto and listen to your favorite stations in the car, or cast what you are listening on any Google Chromecast compatible device. 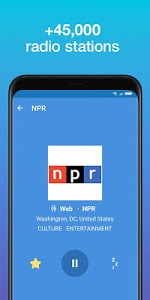 Simple Radio is available on multiple platforms such as: Android Auto, Google Chromecast, iPhone, iPad, iWatch, Amazon Alexa, and Mobile and Desktop Web. Product names, logos, brands, and other trademarks featured or referred to within this profile and the Simple Radio app are the property of their respective trademark holders. These trademark holders are not affiliated with Streema or our services. Similar to "Simple Radio - Free Live FM AM Radio"